In this striking and brutal world imagined by Gentleman’s Game, mankind struggles to hold on to the last vestiges of terrain, both manmade and natural. Man’s tenacious survival instinct and ingenuity give rise to incredible, towering cities built upon the skeletons of long decaying oil rigs and the very few mountaintops able to break the surface of the great, never-ending ocean. The constant struggle for resources and land lead to a proliferation of fantastical modes of transport. Alchemists, utilizing technologies and magics both old and new, create vessels to fill the sea and air, allowing their clans to fight and maybe survive as new Gods watch over their subjects with cool disregard. Among the chaos and despair, the artists still manage to create images of hope. Glimmers of this world’s fragile beauty can be spotted throughout the relentless turmoil. Friend and Griffin, collectively working as Gentleman’s Game since 2011, have explored the themes of mythology, technology, history and mortality viewed through the murky waters of the Atlantic, the vast ocean that covers nearly the entire surface of their world. Their partnership is considered unique, but it is their signature technique for bridging the gap between the digital and the handmade that is unlike any other. Both artists work together to create works by combining mixed media in a process that employs various methodologies rooted in painting, printmaking, collage, drawing and image transfer. Images, textures and handmade marks are often scanned, printed and then transferred to the canvas or paper surface using a fixative. The transfer process is facilitated through the application and removal of numerous layers of paper medium allowing different effects begin to develop and variations are created within the moment. Though technology is integral to their process, it is ultimately the artist’s hand that is responsible for the final creative decisions. Brandon Friend was born in 1980 in Queens, New York, Jason Douglas Griffin was born in 1981 in the DC Metro area. Both were enrolled in the Department of Art Honors Program at the University of Maryland College Park when they first met in 2001. After receiving his undergraduate degree, Friend returned to Queens to complete his MFA at CUNY Queens College, Griffin moved to New York City to pursue his art career. 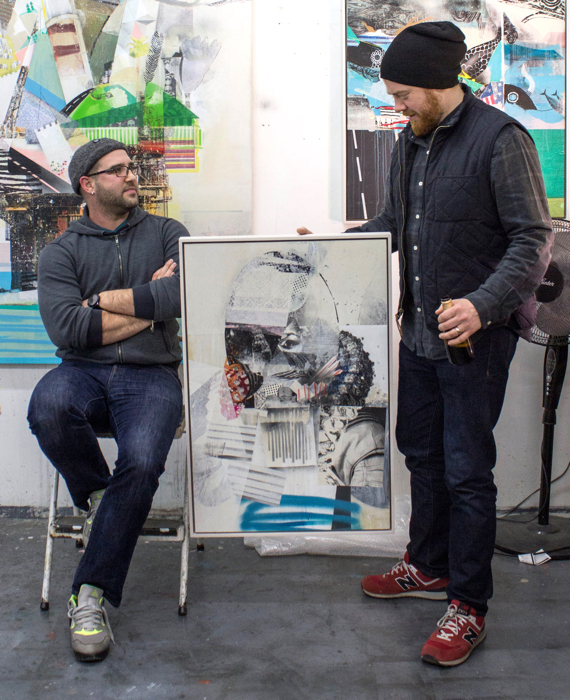 Friend and Griffin later reconnected in New York in 2008 and began sharing the same studio space in Long Island City that they continue to use today. Their first joint effort was for an exhibition at Lambert Fine Art located in New York’s Lower East Side, in 2011. The exhibit tiled, Identity crisis, provided the impetus to create work as a pair, propelling the artists to create an entire wall of collaborations. The name Gentleman’s Game came from a painting that the two created depicting two figures engaged a game of a chess, which served as a metaphor for their creative process. Gentleman’s Game has hundreds of works in private collections around the US and their work has been exhibited in numerous galleries and art fairs including Scope Basel, Texas Contemporary, Project Gallery, LA, Vered Gallery, East Hampton, Scope NY and Fountain Art Fair in New York and Chicago.